The remnants of an old dam on Tony Borton’s land, originally built to power a button factory. Please note the new date: Friday, November 30th. Hilltown Land Trust and Franklin Land Trust are collaborating to bring hikers the opportunity to visit another Conway forest. Owner and volunteer, Tony Borton has opened his trails to us. These trails are in fields and wooded land that have been protected with a conservation restriction held by Franklin Land Trust since 2008. Tony will be leading this hike which will include a narrative with historical and natural references relevant to the area. 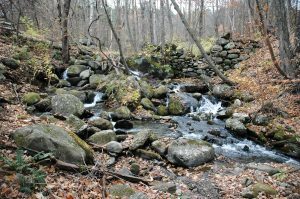 Along with being in a beautiful Conway forest, hikers will see where previous generations used the brooks to create power. Near the end of the hike, we will stand above the remnants of a dam once used to power a button factory that was near Burkeville. Here it will be easy for imaginations to run wild trying to figure out how such large stones were placed. Afterwards, Tony has invited us into the comfort of his colonial home for warm beverages and donuts. This is a moderate hike with soft footing, tree roots and some steep climbs. The pace will be easy and the hike will take about an hour and a half. November is a good month for dressing in layers. The footing may be slippery with autumn leaves on wet ground so be sure to wear good walking shoes. The hike will be cancelled if we have moderate rain. Please, no dogs. Just a few spots left! RSVP today to ensure a space is reserved for you. To reserve your spot, contact Susan Schroder at HLToutreach@thetrustees.org or call 413-628-4485 x 4.